Happy New Year! 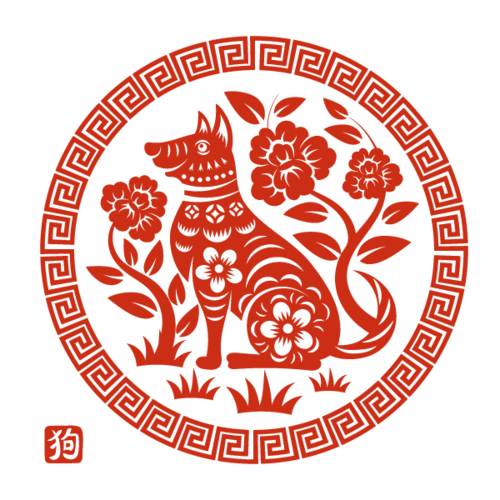 The year of the Earth Dog brings loyalty, kindness, generosity, trustworthiness, and steadfast work. Please see below for Individual Animal Forecasts for 2018 provided by Lillian Pearl Bridges of the Lotus Institute. In Chinese cosmology, Dog is the animal that is paired with the organ network system of the Pericardium, sometimes called the Heart Protector. As a Fire organ in Chinese medicine, the PC is in charge of love, romance, sexuality, and finding joy through connection. Like the anatomical pericardium, which envelops the Heart, the PC acts as the inner gates to the Emperor’s throne room, deciding who shall be let in and who shall be kept out. The PC forms a protective wall around the Emperor’s inner circle, and swiftly lifts the drawbridge to deny entry to anyone who presents a perceived threat. Dog is the animal whose Heart Spirit co-exists with the Heart Spirit of its human companion. Dog is the grounded, animalistic, Earthen counterpart to the ethereal Fiery nature of the human Spirit, which is housed in the human Heart. In Unity with humankind, Dog serves as an externalized PC, protecting the Heart with fierceness, unwavering loyalty and unbreakable faithfulness. Dog embodies the traits of human nature that emerge through the conscious choice to live in service to the Heart and move towards Unity. Dog teaches us loyalty, kindness, generosity, trustworthiness and a sense of responsibility for steadfast work. As such, Dog is a harbinger of love and friendship, defined by unwavering attunement with and fierce protection of those that share it’s Heart. We are now entering Year of the Earth Dog, 2018. The Earth element is about friendship, family connections, belonging, feeling grounded in community, and cultivating and sharing food and any other sources of nourishment- physical, emotional, or spiritual. Dog teaches us empathy, unconditional love, compassion, and a strong desire to be in service to others. The Year of the Earth Dog holds deep potential for grassroots movements, collective consciousness, outreach, egalitarianism, and special care for self, others, and the Earth itself, as the Earth element illuminates the sacred bonds we share with the ultimate Source of life-sustaining food and nourishment. Rat - Water Element: 1924, 1936, 1948, 1960, 1972, 1984, 1996, 2008, 2020: Rats are feeling more creative, business is generally good and there is a chance to be very social. However, watch out for arguments with family members. Tiger – Wood Element: 1926, 1938, 1950, 1962, 1974, 1986, 1998, 2010, 2022: This is a very good year overall – There is luck, especially in business and Tigers will feel optimistic and act more gregarious. They will be very busy in a good way. Rabbit – Wood Element: 1927, 1939, 1951, 1963, 1975, 1987, 1999, 2011, 2023: Progress will finally be made in business, although the results will not be immediate. This is a very good year for romance and marriage. Home life will be much happier and life will start feeling more fun. Dragon*–Earth Element: 1928, 1940, 1952, 1964, 1976, 1988, 2000, 2012, 2024: This is the opposite sign of the Dog so Dragons need to be cautious with money and health. Home life may be difficult. However, business is good and Dragons should travel and meet new people or they may start feeling bored. Snake – Fire Element: 1929, 1941, 1953, 1965, 1977, 1989, 2001, 2013, 2025: This is a mixed year for Snakes. Business will seem very slow and Snakes are advised to work steadily and harder. Snakes will feel more introverted. However, family life will be enjoyable. Horse – Fire Element: 1930, 1942, 1954, 1966, 1978, 1990, 2002, 2014, 2026: This is potentially an exciting and action packed year for Horses. Business will be much more profitable and Horses will enjoy the company of friends and family more than usual. They may move or big changes are possible in the home. Sheep*–Earth Element: 1919, 1931, 1943, 1955, 1967, 1979, 1991, 2003, 2015: This is not a peaceful year as Sheep may find that they are thrust into many confrontations they don’t want to be involved in. There is also increased competition. However, they will find solace in friends and a very happy home life. Monkey-Metal Element: 1920, 1932, 1944, 1956, 1968, 1980, 1992, 2004, 2016: This is a year of ups and downs for Monkeys, but there will also be times of sudden luck. Monkeys will be feeling more assertive and will find success in implementing some of their unusual ideas that previously were not appreciated. Rooster–Metal Element: 1921, 1933, 1945, 1957, 1969, 1981,1993, 2005, 2017: This will be a lot of challenges for Roosters this year, but business will be good and more money can be made but they shouldn’t take any unnecessary risks. It is important that Roosters hold their tongues and keep from fighting. Dog* – Earth Element: 1922, 1934, 1946, 1958, 1970, 1982, 1994, 2006, 2018: This is a mixed year. It is good for moving, remodeling or redecorating. Dogs will be feeling very social but they will not accomplish as much as they want, but they will make good connections and business deals for the future. If it’s your 60th birthday year, it’s a restart and there will be luck for these Dogs. Pig – Water Element: 1923, 1935, 1947, 1959, 1971, 1983, 1995, 2007, 2019: This is a good year for planning for the future – saving money and getting healthy. Overall, this year will feel slow and even boring, but Pigs need to prepare for the events of their own year coming up. Family life will be enjoyable. *Dragons, Oxes, Sheep and Dogs should carry a Rabbit charm for protection this year and to bring more luck their way. A special thank you to Peter Fischer for his contribution to the forecast based on his knowledge of Bazi. DISCLAIMER: All information provided in this forecast is based on the ancient principles of the Chinese Five Element Theory and on an understanding of the animal symbolism in Chinese Astrology. It is intended for entertainment purposes only. There is no express or implied guarantee of results from using this information, and individual users are solely responsible for their own interpretation or application to their own circumstances. Further, the information is not, nor is it intended to be, a substitute for legal, medical, or psychological advice, evaluation and/or treatment. You are welcome to share this post, but please refer to the source. Older PostI Ain't Afraid of No Ghost!